PARIS --- In the closing days of 2016, the aircraft that is billed as the world’s most advanced fighter took six days to fly from Texas to Israel – as long as it took Israel to win the 1967 war. Looking into why a routine delivery flight took so long, we ran into a wall of obfuscation, contradictory explanations, deflections and unanswered questions that, given the F-35 enterprise’s past record, suggested that something was being hidden. 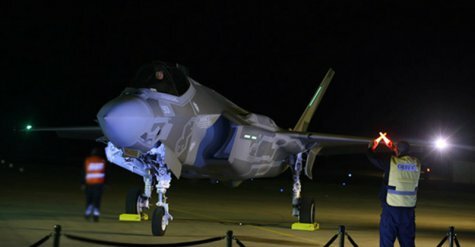 While no evidence of any failure has emerged, we have found no plausible explanation of why the F-35 -- often billed as the world’s most advanced fighter -- took six days to fly from Texas to Israel, nor why, despite its much-vaunted “5th-generation” avionics, it was unable to take off on the final leg of its flight because of fog – fog which did not affect scheduled and air traffic at a nearby civil airport. The two F-35Is (serial numbers 901 and 902) took off from Lockheed Martin’s final assembly line in Fort Worth, Texas, on December 6, Lockheed spokesman Mike Rein said in a Dec 13 e-mail, and landed at their final destination, Nevatim air base in southern Israel, at 19:00 hours on December 12 – six days later. Rein declined to provide additional information on the transit, and referred questions to the F-35 Joint Program Office, whose spokesman Joe DellaVedova did not respond to repeated e-mail messages. Asked for additional details, a spokesman for the Italian air force, which owns Cameri air base, referred questions to the Italian Defense Staff, where a senior spokesman said Dec. 15 that, out of consideration for a foreign power, he could not provide information on foreign military aircraft transiting through Italian airspace. We determined that the F-35s made two stopovers: one at Lajes, on the Azore Islands in the Atlantic Ocean, and a second one at Cameri air base, in northern Italy, from where they took off on Dec. 12 for the final leg of their flight to Israel. This was finally confirmed on Dec 16 by another Lockheed spokesman, Eric W. Schnaible, who said the jets arrived at Lajes on Dec. 6 and at Cameri on Dec. 8, where they remained until taking off for Israel on Dec. 12. While heavy fog is said to have prevented the F-35s from taking off from Cameri air base on the morning of Dec. 12, commercial traffic at Milan-Malpensa airport, 8.5 km away as the crow flies, was unaffected. “The US Military Defense Contract Management Agency (DCMA) F-35 ferry pilots planned, coordinated USAF tanker support for trans-Atlantic Ocean aerial refuelings and accomplished the delivery in three legs to meet the IAF's request for a 12 Dec 1400 arrival. -- Why did the F-35s leave Fort Worth on Dec. 6, if they were only expected in Israel on Dec. 12? -- Why did the two F-35s spend 36 hours at Lajes, instead of flying out the next day? -- Why did they fly to Cameri, in northern Italy, while the direct flight route would have taken over central Spain and southern Italy, 1,000 km south of Cameri? -- Why did they then spend three days at Cameri, instead of flying directly to Israel? -- Did any unforeseen technical problems delay the flight? It also is strange that the F-35s took a detour through Cameri, in northern Italy, when the direct flight route from Lajes to Israel overflies central Spain and Sicily, where several military air bases could have provided secure stop-over facilities. The NATO air base at Sigonella, Sicily, for example, is located just under the direct flight route, has all necessary facilities – except for the F-35’s Autonomic Logistic Information System – and furthermore is not at risk of fog, unlike the notoriously foggy Po valley where Cameri is located. The direct distance from Cameri to Sigonella is approximately 1,050 km. Asked to comment, Lockheed’s Schnaible said he did not know why Cameri was preferred, “but the FACO may have been a better F-35 support facility if needed.” The FACO is the F-35 Final Assembly and Check-Out facility also located on Cameri air base. Lockheed’s Schnaible said that “There were no technical delays, and I am told the jets arrived Code One, meaning no discrepancies.” He referred further questions about the Cameri layover to the Italian air force whose press office, as stated above, declined to comment. It also should be noted – as detailed below – that contradictory explanations were given for the six-hour delay in the Dec 12 takeoff from Cameri, none of which proved correct. The F-35s were due to take off from Cameri on Dec. 12 at 7 a.m., so as to arrive at Nevatim air base, in southern Israel, at 14:00 local time. Their arrival was to be the high point of an official ceremony to which 4,000 people had been invited, including the President of Israel and government ministers. -- The first pair of “Adir” (F-35I) stealth fighters will land in Nevatim AFB today! Since the F-35s arrived six hours late, they presumably also took off from Cameri six hours late, or around 12:00 Italian time. -- Lockheed Martin vice president Jack Crisler cited “local rules in Italy.” He told Agence France Presse in Nevatim Dec. 12 that the F-35 can take off in fog, and does so every day, but “there's just local rules in Italy that say you have to be able to visually see a certain distance before they will let you take off." There is no general minimum visibility requirement in Italy, the Italian Defense Staff spokesman said during a Dec. 15 telephone interview. All airports and air bases have their own specific requirements, according to pilot qualifications, the type of ground navigation equipment and ground markings, he added, but could not say what the minimum visibility requirement is for Cameri air base. -- The Times of Israel reported from Nevatim that the F-35s “were grounded for hours in Cameri, Italy, due to the one-two punch of inclement weather and ‘American safety regulations.’” It also reported that “Italian authorities wouldn’t let them” take off, an assertion for which no source is provided, and that we have been unable to confirm. -- Haaretz daily quoted Israel Air Force Chief of Staff Brig. Gen. Tal Kalman as telling reporters at Nevatim that “it was decided to delay takeoff due to the bad visibility. ‘Since this was not a combat mission … we decided against endangering the planes and the pilots and to postpone the flight,’ he said. This is certainly true, but it is not what Crisler was quoted as saying; in fact, it is the exact opposite. Furthermore, while the F-35 may not be “limited by fog,” in this case it clearly was. Cameri air base (LIMN) is located about 8.5 kilometers from Milan’s Malpensa international airport. On Dec. 12, while the area experienced dense fog, it did not disrupt Malpensa’s flight schedule (see above), and 16 scheduled flights took off from Malpensa between 07:20 and 08:30 – the same time when the F-35s proved unable to take off. Milan Malpensa international airport is only 8.5 km from Cameri air base as the crow flies, but was not affected by “heavy fog” which prevented the F-35s from taking off. The explanation offered by the IAF’s Gen. Kalman is perfectly plausible: Since this was not an operational flight, it was decided to postpone takeoff in order not to risk endangering the American pilots and the planes. Why, then, make up other explanations? Given the fact that several thousand VIPs and other guests were waiting at Nevatim air base, and because of continuing controversies regarding the F-35, it is however surprising that takeoff was delayed by six hours, even as civilian air traffic continued unaffected. “Not since the first planes of Israel’s then-new fleet of F-15 jet fighters touched down in the Jewish state on a Friday night, after the start of the Sabbath in December 1976 – spurring the National Religious party to quit the coalition and topple Yitzhak Rabin’s government – has there been a more embarrassing episode for the air force than what happened on Monday. “Hundreds of people attending the ceremonial landing of the air force’s first two F-35 stealth fighter jets in Israel at 2:30 in the afternoon on Monday were forced to wait for several long hours as the planes remain grounded in Italy due to fog. “The ceremony, which was eventually delayed until 7:30 p.m., was attended by the prime minister, the defense minister, outgoing US Secretary of Defense Ashton Carter, the IDF chief of staff, the commander of the air force and other dignitaries. “The delay seemed particularly odd, because the plane’s manufacturers, spokespeople and Israel Air Force officials boasted that this was the most advanced plane in the world, capable of evading radar. Suddenly it was delayed at the airport in Italy because of low visibility and fog. It is even stranger, because other planes in Italian airspace continued to take off and land while the F-35s were grounded. Why, given that a perfectly reasonable and plausible explanation existed, did the Israeli Air Force and Lockheed Martin refer to imaginary “local rules in Italy” and “American safety protocols,” and why did Lockheed’s Crisler tell reporters at Nevatim that “Italian authorities” halted the takeoff? Yet more questions about F-35 operations that will remain unanswered.